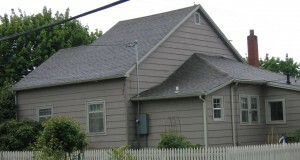 At the corner of 2nd Street and Polk Avenue in Corvallis stands the home of Kate MacTavish and Drew Robertson. Built circa 1912, this house was originally described in official documents as a 1 ½ story dwelling although it suffered a fire some time around the mid-forties and has been occupied as a one story dwelling ever since. Located at the edge of the central business district and surrounded by numerous historic buildings, the owners cherish it for its location and proximity to the amenities of the downtown area including the Willamette River which is just steps across the street. The corner lot provides plenty of gardening opportunities both in the yard and in the surrounding parkway which Kate and Drew put to maximum use. The house itself, however, was getting a bit small for this family of four and they decided it was time to reclaim the upstairs area that was lost to the fire. The plan for the house is to add two large dormers onto the roof, expanding the usable area of the attic to its full potential. It will be transformed into Kate and Drew’s bedroom with a separate bath across a hallway that leads to a cozy reading nook overlooking the Willamette. Wide-plank fir has been chosen for all the floors except in the bath where 1″ hexagon tiles will be installed. A large claw-foot tub and pedestal sink will keep the room feeling spacious and clean and a large window affords views of the river from the tub. 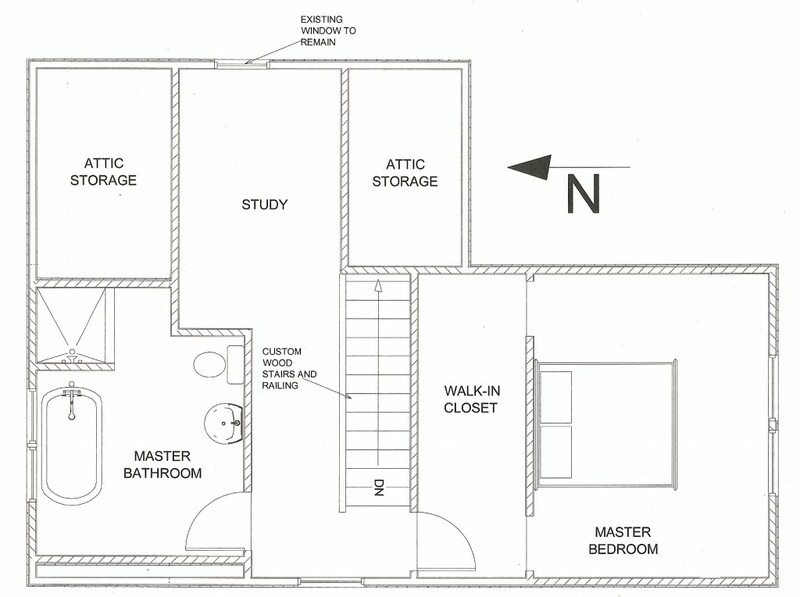 Since the existing structural system is sufficient to support the new floors with a small amount of foundation strengthening, the only change to the existing downstairs space will be the new staircase. The first stages of preparation have begun with the erection of scaffolding to give the construction crew access to the upper floor. 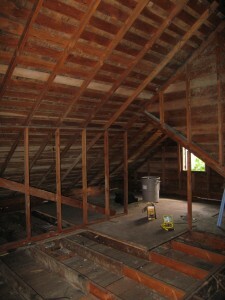 Next the roof will be removed and then the real transformation begins. 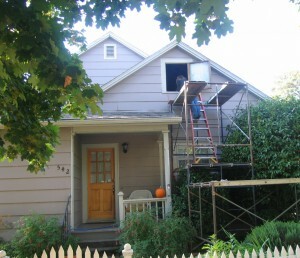 Check back to this remodeling blog soon as we chart the progress of this addition in pictures and words.